Crochet, craft and patterns! Follow my all year round challenge for 2016 and get some free fun patterns! I don't know how it is at your place, but here at home Frozen is still favorite nummer one! Here monkey number 3 even has a Frozen themed room! !. Important: always start and finish your round in the same stitch as the chain 2, this way you get a invisible seam. And never finish in the chain 2 but always in the first double crochet.! Round 1: Crochet 11 dc in a magic ring. ch 2. Round 2: 2 dc in elk dc (22 st), ch 2. Round 3: 2 dc in 1st stitch 1 dc in next, repeat to end (33 st), ch 2. Round 4: 2 dc in 1st stitch, 1 in the next 2, repeat to end (44 st), ch 2. Round 5: 2 dc in 1st stitch, 1 in the next 10, repeat to end (48 st), ch 2. Round 6: 2 dc in 1st stitch, 1 in next 11, repeat to end (52 st), ch 2. Round 7: 2 dc in 1st stitch, 1 in next 12, repeat to end (56 st) ch 2. Round 8: 2 dc in 1st stitch, 1 in next 13, repeat to end (60 st), ch 2. Round 9 – 13: 1 dc in each stitch (60 st), ch 2. 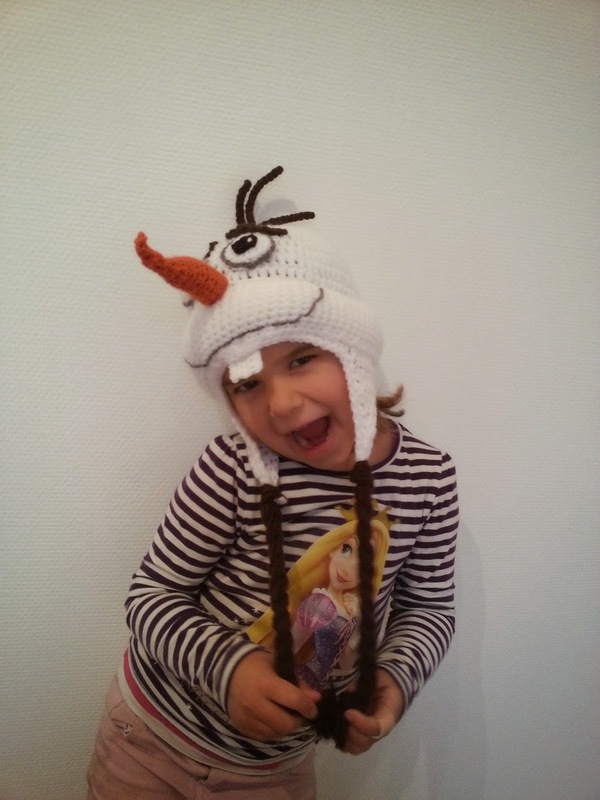 Don’t bind off but follow pattern at earflap. Round 9: 2 dc in 1st stitch, 1 in next 14, repeat to end (64 st), ch 2. Round 10 – 14: 1 dc in each stitch (64 st), ch 2. Round 10: 2 dc in 1st stitch, 1 in next 15, repeat to end (68 st), ch 2. Round 11 – 15: 1 dc in each stitch (68 st), ch 2. Round 11: 2 dc in 1st stitch, 1 in next 16, repeat to end (72 st), ch 2. Round 12 – 16: 1 dc in each stitch (72 st), ch 2. Row 3: 8 hdc , ch 2, turn. Row 8: dcr 2 hdc, bind off. Row 8: dcr 2 hdc, ch 1, turn and sc 2 times across the hat. Row 5: 8 hdc , ch 2, turn. Row 10: dcr 2 hdc, bind off. Row 10: dcr 2 hdc, ch 1, turn and sc 2 times across the hat. (60/64/68/72) + 10 extra en bind it with a slst in the first chain in a round. Round 1 - 10: ch 1 and sc to the end, in the last round bind off. Put the bottom of the crocheted piece exactly on the edge of the hat and sew it with your tapestry needle, now fill it with fiberfill and put the top on the 3th dc from the bottom, sew it and fill further as you close. Round 1: Crochet 8 hdc in a magie ring. Maak een magische ring. Round 2: ch 2, *2 hdc in each st* repeat 7x. Round 3: ch 2, *2 hdc in 1th st, 1 hdc in next st* repeat 7x. Round 4: ch 2, *2 hdc in 1th st, 1 hdc in next 2 st* repeat 7x. Bind off. Round 1: Crochet 8 hdc in a magie ring. Bind off. Crochet slip stitches over the white hdc of round 3. Put al parts together and make with a small thread of white a french button in the Black part of the eye. Sew the eyes 1 rol above the cheeks and leave 1 stitch of space between the eyes. Ch 10 + 1 turn ch. In the 1th ch from crochet needle crochet 5 hdc, 5 sc. Sew the eye brons above the eyes. Row 1: 2 sc in 2nd ch. Repeat row 4 - 6 until you have 16 sc. Crochet 5 rows of 16 sc and bind off, leave a long thread. Fold the piece and sew the sides on to each other and leave the top open, fill with fiberfill. Sew the nose on the front of the hat. Make sure half of it is on the cheeks and half of it is on the hat. 10 slst in 10 ch. 16 slst in next 16 ch, and a slst in a ch base. 7 slst in next 7 ch, and a slst in the ch base. Bind off. Sew the piece of hair on top of the head, right above the hole of the magie ring. 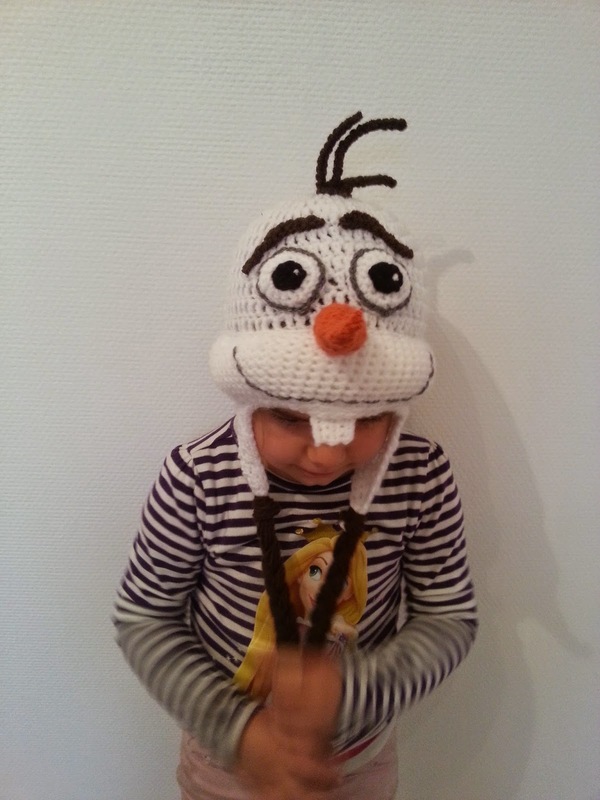 And voila a super cute Olaf head! 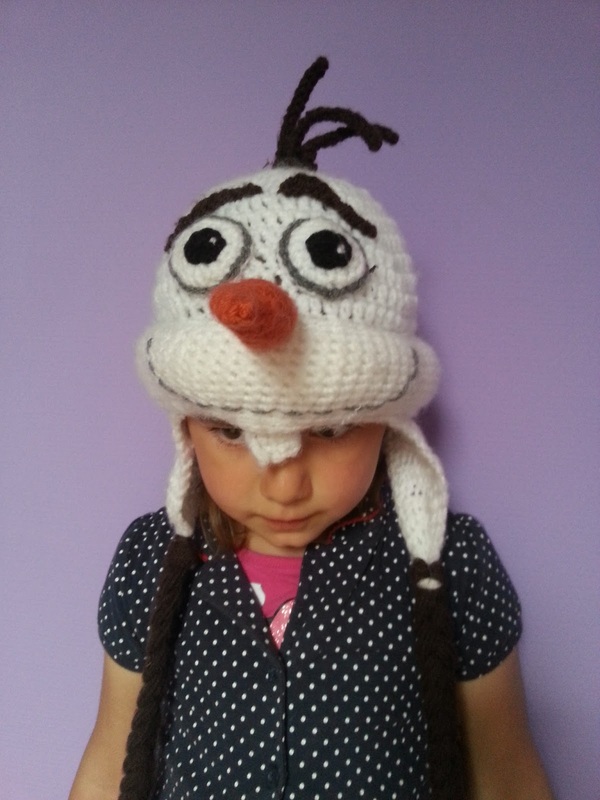 When you have made a hat with this pattern please put a link to this blog when you publish it on social media. Please do not publish this pattern as your own, I put a lot of work in writing and translating it. When you sell a finished product please refer to ©We Love Cozy. Ik heb net je FB pagina ontdekt. Geliked en gedeeld. Je blog ontdekt en je raverly. Nou ik heb je blog meteen bij de mijne neergegooid. Super leuke ontwerpen maak je! Geweldig leuk! Dank je wel Diana! Ik zal jou er ook tussen zetten!